Fraunhofer IGD, in collaboration with the Getty Research Institute in Los Angeles, has scanned the entire interior of the Berlin Philharmonie to create a 3D-printed model as part of the exhibition »Frank Gehry – Hans Scharoun: Strong Resonances / Zusammenklänge,« which can be seen for the first time in Europe at the Max Liebermann House by Stiftung Brandenburger Tor in Berlin on November 9, 2018. The two starchitects, Hans Scharoun and Frank Gehry, never met in life – and yet, through their perhaps most famous works, are intertwined. Frank Gehry drew inspiration from Scharoun’s building when designing the Walt Disney Concert Hall in Los Angeles, which opened 15 years ago. The exhibit at the Max Liebermann House by Stiftung Brandenburger Tor in Berlin will show a direct comparison of both concert halls for the first time in Europe, including a 3D model of the Berlin Philharmonie scanned by the Fraunhofer Institute for Computer Graphics Research IGD. The exhibition was conceived by the Getty Research Institute in celebration of the 50th anniversary of the sister city partnership between Berlin and Los Angeles and took place in Summer 2017 in Los Angeles under the title »Berlin/Los Angeles: Space for Music«. During preparation, the curators discovered that the largely handcrafted models from the 1950s that Scharoun used to design the Berlin Philharmonie have either disappeared or been destroyed over time. But actually seeing a model of both buildings in direct comparison to one another was envisioned as a fundamental part of the exhibition. The planners in Los Angeles developed the idea of scanning the entire interior of the Philharmonie and reproducing the model as a 3D print. This led to collaboration with Fraunhofer IGD, one of the world’s leading institutes for applied visual computing research. The Competence Center Cultural Heritage Digitization is specialized in automating the process of 3D digitization of cultural heritage artifacts, from single artefacts to architectural structures, and previously scanned the Pergamon Altar in Berlin in 3D. »The Berlin Philharmonie was one of the greatest and most complex scanning endeavors for our team,« explained head of the competence center Pedro Santos. A special laser scanner was used whose beams were reflected by horizontally and vertically rotating mirrors. This allowed the scanner to discern 3D points in a 360° environment. To digitize the complex concert space down to the smallest detail, researchers placed the laser scanner in 98 different positions. The result was a 3D model true to the original followed by a realistic 3D print. For the exhibition in Berlin, a new, larger architectural model of the Berlin Philharmonie will be produced based on Fraunhofer’s 3D scans. 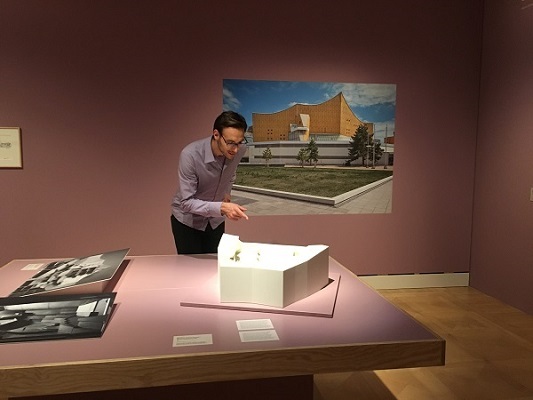 Visitors will have the chance to view the models of both concert houses along with numerous drawings, sketches and photographs of Scharoun and Gehry at the Max Liebermann House by Stiftung Brandenburger Tor until January 20, 2019.